This past weekend I was fortunate enough to attend the SXSW Interactive Festival in Austin, Texas. I've been dreaming of going for years now, and when I finally got the opportunity as part of my job as a Community Manager at Purina, I couldn't believe it! 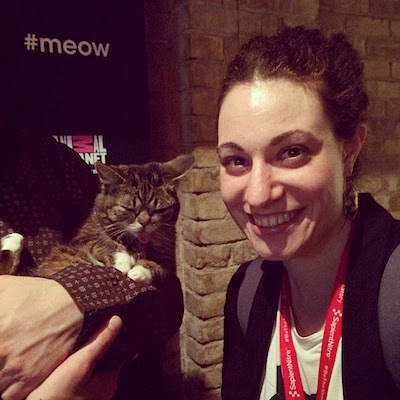 I was in town with Pro Plan Cat, who were one of the sponsors of the MO FILM 2014 SXSW Awards. During the party, which included a film screening and gourmet BBQ, one talented filmmaker received a prize for creating a cinematic cat video that answered the question, "What's so great about a cat?" We were also there gathering stories for @ProPlanCat, which just went live on Twitter and Instagram last week! 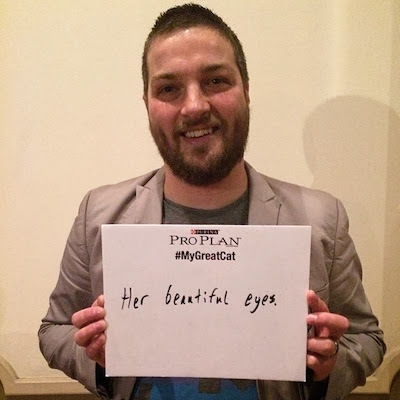 I'd love for you to follow us and tag your cat photos with #MyGreatCat for a chance to be featured in the community. As an added incentive, if you also mention @catsparella in your tweets or Instagram posts, I'll send you a surprise when we launch the Pro Plan Cat Facebook page in April! As for the rest of the conference, it truly was a cat lovers paradise. After taking in an inspiring discussion with Nasty Gal CEO Sophia Amoruso, we headed to the infamous Mashable House, AKA heaven on earth for a pop culture enthusiasts who spend the bulk of their waking hours on the internet. 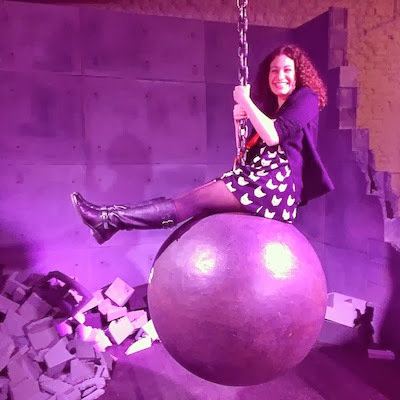 After signing signing my life away on a release form, I had the opportunity to swing on a wrecking ball, Miley style. 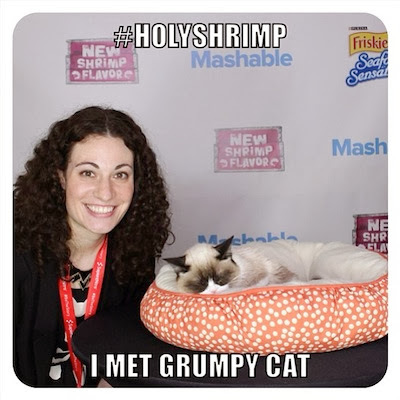 Next, I turned into a real life cat emoji when I got to take a picture with Grumpy Cat! The internet's most famous feline was there representing Friskies (another Purina brand, natch), and delivering food to needy cats in the Austin area. The Iron Throne just got a whole lot cattier. I thought I couldn't take any more excitement after that, but boy, was I wrong. 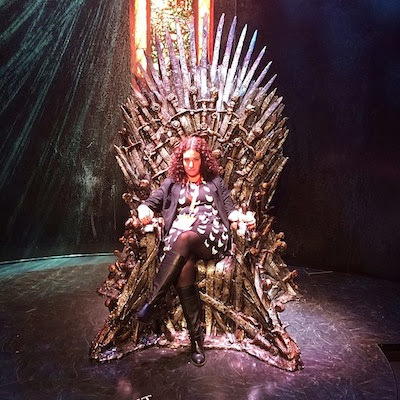 A stop at the Game of Thrones exhibit across town was another highlight of the trip, and a chance to sit on the Iron Throne brought out my inner Cersei (after a brief hiatus, my cattitude is back!). Afterwards, I rushed back to the Austin Convention Center for the most highly anticipated session of the conference: Cat Cash: The Economy of Internet Cat Videos. The panel included Will Braden (Henri, Le Chat Noir), Ben Lashes (Meme Manager to Grumpy Cat, Nyan Cat, Keyboard Cat and more), Grace Suriel (Director of Social Media at Animal Planet), and Scott Stulen (Curator of the Internet Cat Video Festival). Lil Bub's dude, Mike Bridavasky, was also in the crowd, but nothing caused more pandemonium than when Grumpy Cat made a surprise appearance. Quincy insisted that I get her good side. The rain wouldn't let up, but an an emergency umbrella run led us to Wild About Music, where we were greeted by an awesome shop cat named Quincy! This spunky girl made my already unforgettable day complete, and wouldn't you know it - she's a social media maven like myself, with her very own Twitter account! Day 2 of the conference consisted of a heavy day of sessions (including one about Twitter and Sharknado, because why not), but once the sun went down, it was time to get my cat party on. The cool cats at Animal Planet were kind enough to send me a VIP invite to their Cats Live Here Party, a celebration of all things feline. Needless to say, the kitty-themed bash was all I could have dreamed of and more. The Glamourpuss was the must-have cocktail of the night (by me). Guests were treated to cat-themed cocktails, quirky buttons, and cake pops. Kicking it with Lil Bub in the VIP lounge. There was even an appearance in the VIP lounge by none other than Lil Bub! A view from the top of the best cat party ever. The culmination of the bash was a rousing performance from 80s cover band, The Spazmatics. I must say, if you're in Texas, you must check these guys out. After dancing the night away, I ended up standing in line for a free cronut at 2 a.m. (alas, it did not come to pass). But if that's the worst thing that happened all weekend, I think I did OK. Thanks for stopping by to see what I've been up to! If you'd like to keep up with my latest project, follow @ProPlanCat on Twitter and Instagram, and tag your pics with #MyGreatCat for a chance to be featured in our new community! Wow! It sounds like you had a super weekend. (I also love Dave's sign.) Sounds like Pro Plan Cat has some Great plans! It was a pretty exiting weekend! ;) Thanks for stopping by, Georgia! I miss chatting with all my cat friends! You look like you had too much fun! My human is envious. I miss your human, Sparkle! I hope I get to see her at a cool kitty event soon. Purrrfect coverage of the event! Sorry to see there weren't any kitty bands this year. (I do believe you covered one on your blog some time ago) jk. Kokoro Purrs ~ mum's phone isn't playing nice.